Cool roofs, with highly reflectivity and emittance, can be 70 degrees cooler or more during hot summer days when compared with traditional roofing materials. Cool roof systems save money and energy during peak cooling demand periods – typically mid-days, when electricity demand and costs are highest. A cool roof surface can reduce the cost of operating rooftop HVAC units because the units will use cooler air than if mounted on a dark roof surface. Cool roof systems help reduce the urban heat-island effect by reflecting solar heat rather than absorbing and transferring it to buildings. 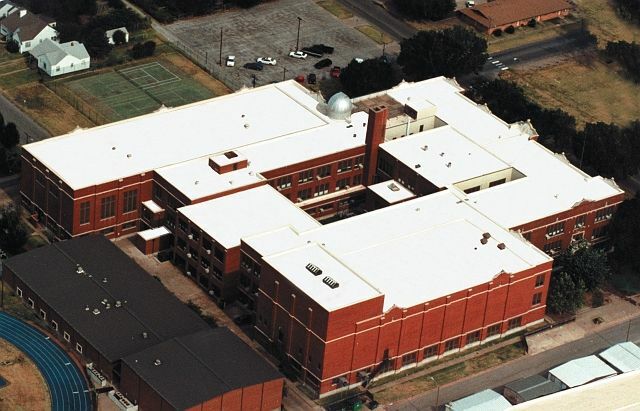 By keeping moisture out while reflecting ultraviolet (UV) and infrared (IR) radiation, a cool roof can help to protect underlying insulation and the roofing sybstrate from deterioration. The Duro-Last Cool Zone® cool roof system offers all these benefits, and more. In fact, the Cool Zone system delivers the Five E’s of sustainable roofing: Energy, Environment, Endurance, Economics, and Engineering.